Over the past weekend and mid-week, we have been eating out quite a bit so I thought I’d share some of the photos and details of these delicious eats. These include some restaurants and cafes on the Gold Coast and in my hometown of Brisbane. This roundup started from last weekend when we took a little break to the Gold Coast. We stayed in two family hotels, at Sanctuary Cove and Benowa. We don’t normally do hotel crawls, but it was great fun to do. We got to experience two different places and give my toddler new surroundings to explore. On our first day, we spotted a vegan cafe that I’ve been wanting to try for a while. Feed the Earthlings is in Broadbeach and is a serves 100% vegan burgers, pizza and fish and chips. The cafe itself is more of a snack shop and doesn’t have much in the way of decor, but it did win the best Burger on the Gold Coast (2017). We weren’t really hungry so we all share the Cheese Burger and Gourmet Vege Pizza. The burger was fantastic. It tasted just like a cheeseburger but just better. The pattie itself that a very similar texture, but of course did lack a strong meat flavour. I think it was made of black beans, onion and mushroom. The sauces and cheese were great though. I don’t think I’ve eaten a cheeseburger for 15 years, so it was a great guilt-free version. Marco quite liked it too. The pizza wasn’t my favourite, but it wasn’t bad. I think some of the ingredients were missing, so it didn’t have the flavour I was expecting. The ingredients were fresh and cheese was very melty. I would give them another chance. I think it was just such a hot day and there was a bit of confusion. Later we made it to the InterContinental Sanctuary Cove Resort, on Hope Island. The hotel itself would have been nice in its day, but definitely had been let go. The room was also very average and wasn’t as clean as I would like. The staff, however, were fantastic. What was nice was there were families of kangaroos, ducks, and lots of native birds on the grounds, which was very exciting for Octavia. For dinner, we decided to visit George’s Paragon Seafood Restaurant, at Sanctuary Cove. I have been here numerous times for family events so I knew what to expect. The restaurant is located on the marina and is really gorgeous. There were plenty of fish on the docks to keep Octavia busy to watch, instead of rearranging the nearby tables. We ordered a few meals to share since we had a picky toddler, who is very unpredictable with her food preferences when we eat out. So we ordered some Saganaki, Spanakopita, Prawn Fettuccine, and Eye fillet Medallions. Everything was presented beautifully and quite promptly. We quite liked the Saganaki and Spanakopita. Marco’s eye fillet was very chewy and the mashed potato tasted like it was instant mash, which was a bit disappointing. The prawns in the fettuccine were really fresh and plum, but the pesto sauce didn’t have much of a kick. All in all for the price it wasn’t a bad dinner. However, I would have prefered a bit more flavour. Our second hotel was the Royal Pines Resort, in Benowa. It is known for the golf course but they also have a big water park, playground and a few restaurants. I really liked this hotel and would definitely stay here again. The rooms were up to date and clean and the facilities were impeccable. We had lots of fun at the waterpark and playground. Unfortunately, Marco did have to work this evening, but if he was stationed in the area, which is why we chose this hotel in particular. That evening Octavia and I had a mama and daughter dinner, at the Italian restaurant in the hotel, Trattoria Amici. I ordered her the kids Spaghetti Bolognese and I had the Lamb shanks with green beans, mash and jus. My dish was excellent and a really big portion. Octavia really loves eating meat off the bone, so it wasn’t long until she noticed what was on my plate. She did pretty well with her meal, so afterwards we ordered some dessert. We had to try the house-made Pear and Raspberry Cake with chocolate cream. I was hoping that it was going to be a petite dessert but it was huge. Octavia didn’t mind and I was trying not to think about how much sugar she was eating. It was so good though. The next morning we needed something healthy, well I did. So we visited the Cardamon Pod at Broadbeach for breakfast. They offer vegan and vegetarian, dishes and drinks that are super healthy and really delicious. We have been here a few times in the past. I ordered the Avocado on bread with Tempeh and Marco ordered the Gluten-free Waffles. They were both presented really nicely and tasted great. I really like the extra editions on the plate of almond hummus, seeds and salad. Marco and Octavia really enjoyed the little meringues, bright coloured soil and fresh berries. Luckily my meal was big enough to share with them since they were both fighting over the waffles and ice cream. These next couple of meals weren’t over the weekend but in the follow days. Marco and I had a breakfast date at Nodo, in Fortitude Valley, Brisbane. I wrote a post a while back about this amazing gluten-free bakery cafe, that you must try if you haven’t. The last time we visited we did have breakfast and really enjoyed it, so I was eager to try something different. 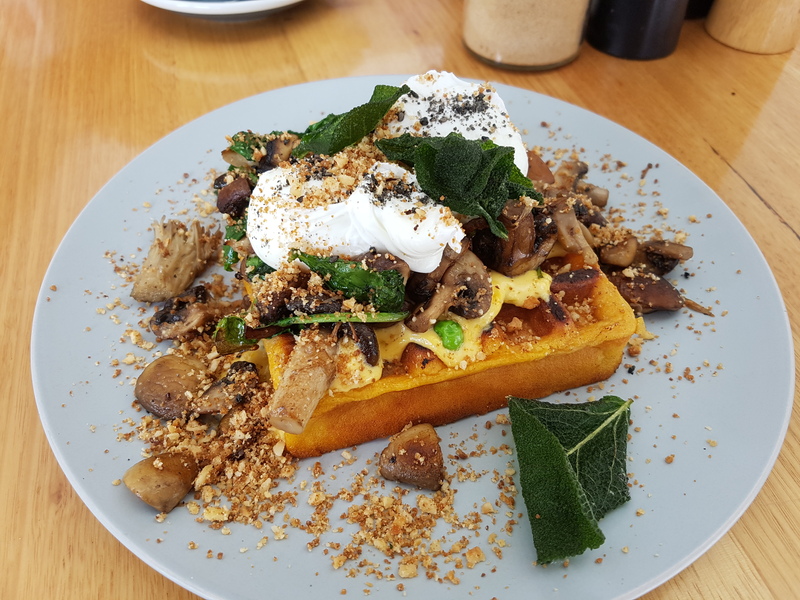 Marco stuck with the Breakfast bun, but I had the Sweet Potato Waffles, with wild mushrooms, hemp seed hollandaise, smoked hazelnut crumb, crispy sage and soft eggs. Omg, this was fantastic, I enjoyed every mouthful. Everything element was cooked perfectly and tasted right on. We couldn’t fit in donuts, but we did take some home, which I didn’t photograph, but you can see these amazing gluten-free baked donuts in my previous post. 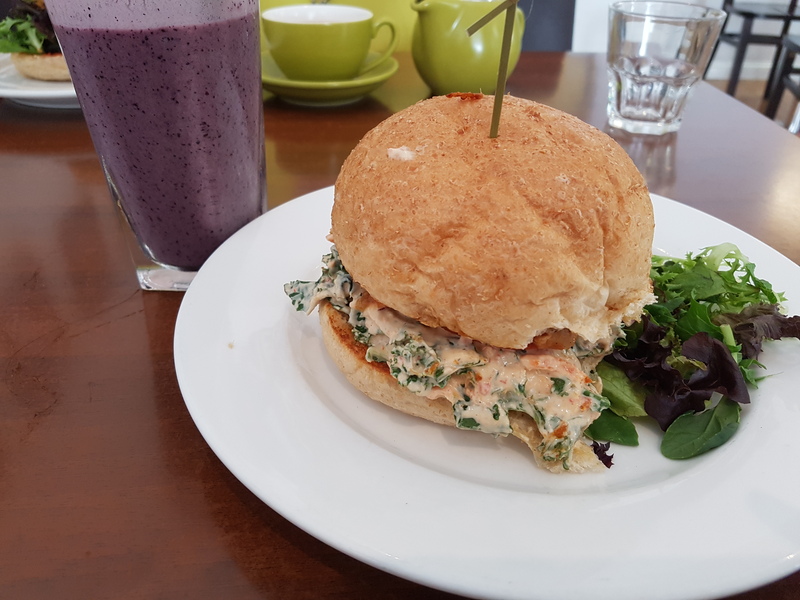 This last burger was from The Green Edge, in Enoggera, Brisbane. I use to visit this vegan supermarket/cafe a lot when I was transitioning to a plant-based. However, since having Octavia and not following a strict diet I haven’t had lunch here in a while. A friend of mine is currently in her transition to vegetarian, so I suggested visiting for lunch. So that was my weekend and mid-week roundup of delicious eats. If you have been to any of these restaurants and cafes, let me know what your experience was. If not, I hope you can visit some of them in the future. The food all looks so delicious!